The active voice describes a sentence where the subject performs the action stated by the verb. It follows a clear subject + verb + object construct that's easy to read. In fact, sentences constructed in the active voice add impact to your writing. With passive voice, the subject is acted upon by the verb. It makes for a murky, roundabout sentence; you can be more straightforward with active voice. As such, there are many ways to change the passive voice to the active voice in your sentences. Over time, writing in the active voice will become second nature. Let's explore several examples of active and passive voice to keep your passive voice tendencies a thing of the past. Pay special attention to the subject in each sentence. Is the subject performing the action? If so, you have a nice, clear sentence, written in active voice. In sentences containing passive voice, it's sometimes unclear what the subject is about. In fact, the subject often falls to the end of the sentence, instead of the beginning. As you read through the following example sentences, you'll start to become an active voice expert. Harry ate six shrimp at dinner. At dinner, six shrimp were eaten by Harry. Beautiful giraffes roam the savannah. 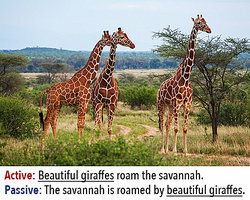 The savannah is roamed by beautiful giraffes. Sue changed the flat tire. The flat tire was changed by Sue. We are going to watch a movie tonight. A movie is going to be watched by us tonight. I ran the obstacle course in record time. The obstacle course was run by me in record time. The crew paved the entire stretch of highway. The entire stretch of highway was paved by the crew. Mom read the novel in one day. The novel was read by Mom in one day. I will clean the house every Saturday. The house will be cleaned by me every Saturday. The staff is required to watch a safety video every year. A safety video will be watched by the staff every year. Tom painted the entire house. The entire house was painted by Tom. The teacher always answers the students' questions. The students' questions are always answered by the teacher. The choir really enjoys that piece. That piece is really enjoyed by the choir. The forest fire destroyed the whole suburb. The whole suburb was destroyed by the forest fire. The two kings are signing the treaty. The treaty is being signed by the two kings. The cleaning crew vacuums and dusts the office every night. Every night, the office is vacuumed and dusted by the cleaning crew. Larry generously donated money to the homeless shelter. Money was generously donated to the homeless shelter by Larry. The wedding planner is making all the reservations. All the reservations are being made by the wedding planner. Susan will bake two dozen cupcakes for the bake sale. For the bake sale, two dozen cookies will be baked by Susan. The science class viewed the comet. The comet was viewed by the science class. The director will give you instructions. Instructions will be given to you by the director. Thousands of tourists visit the Grand Canyon every year. The Grand Canyon is visited by thousands of tourists every year. The homeowners remodeled the house to help it sell. The house was remodeled by the homeowners to help it sell. The saltwater corroded the metal beams. The metal beams were corroded by the saltwater. The kangaroo carried her baby in her pouch. The baby was carried by the kangaroo in her pouch. Do you see how the same idea can be written in dramatically different ways? Hopefully, you see how much clearer and more direct the active voice is. If you're up for a few more examples, click here to continue practicing changing the passive voice to the active voice. "Examples of Active and Passive Voice." YourDictionary, n.d. Web. 18 April 2019. <https://examples.yourdictionary.com/examples-of-active-and-passive-voice.html>. The active voice describes a sentence where the subject performs the action stated by the verb. It follows a clear subject + verb + object construct that’s easy to read. In fact, sentences constructed in the active voice add impact to your writing.With passive voice, the subject is acted upon by the verb. It makes for a murky, roundabout sentence; you can be more straightforward with active voice. As such, there are many ways to change the passive voice to the active voice in your sentences.Over time, writing in the active voice will become second nature. Let’s explore several examples of active and passive voice to keep your passive voice tendencies a thing of the past.